Silver Strikers forward, Khuda Muyaba, underlined his prowess in front of goal by becoming the first to bag a hat-trick as the TNM Super League kicked off last weekend. 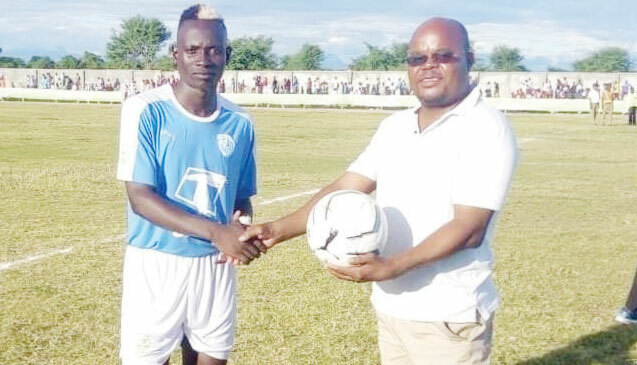 During Silver’s opening match against Karonga United on Saturday, Muyaba also made history when he scored the fastest goal in week one as he opened the scores after 12 minutes in the Central Bankers’ 3-2 win at Karonga Stadium. The former Moyale hitman capped his five star performance with a Man-of-the-Match award after helping Silver to collect full points. In an interview after the match, Muyaba said he was excited with his achievements on the first day of the league. “Emerging Man-of-the-Match and scoring a hat trick in a single game is no mean achievement. I am delighted with this achievement and do not take it for granted. But credit goes to teamwork. We are well prepared to excel as a team this season. “Football lovers should expect a lot from me this season. I joined Silver in the course of last season and, now that I have settled down, there will be fireworks,” he said. Silver Team Manager, Hellings Mwakasungula, said Muyaba’s success comes from hard work and discipline. “Khuda works hard both during matches and in training. He pushes himself as if he were playing his last game. His performance does not surprise me at all. He is focused and sets targets for himself. Khuda is the reason we have started the season on a high,” Mwakasungula said. Peter Nselema scored Karonga’s two goals to join Babatunde Adepoju and Harry Nyirenda (both Be Forward Wanderers) and Nyasa Big Bullets forward Chiukepo Msowoya in registering braces.